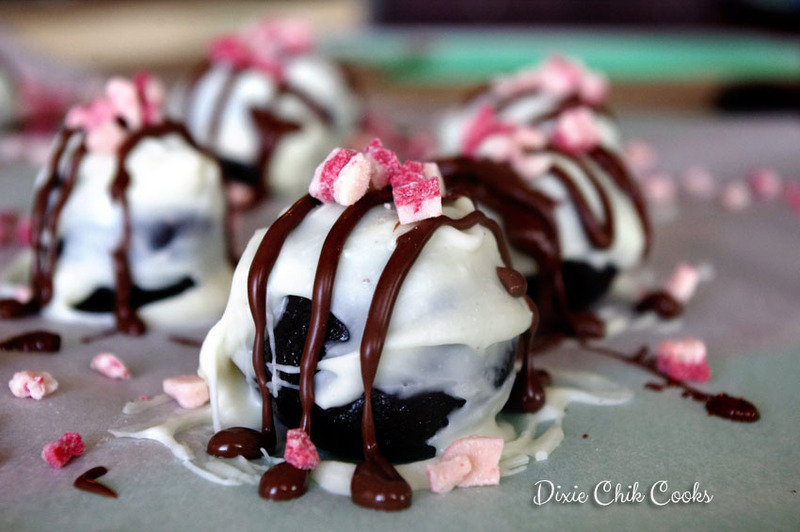 I was recently contacted by a rep from Yummly with an opportunity to put my own spin on their traditional Oreo Cookie Balls, which are crushed Oreos with cream cheese, rolled into balls and dipped in chocolate. I thoroughly enjoyed making these. My family thoroughly enjoyed eating them! The toffee adds an extra little bit of yummy crunchiness. In a food processor, pulse the cookies until they're crumbs. Add cream cheese and toffee chips and pulse until combined. Roll into balls and freeze for 30 minutes. Melt the white chocolate with 1 tbsp shortening and peppermint extract on low in the microwave (50%) for 30 seconds at a time, stirring in between, until melted. Do the same for the milk chocolate. 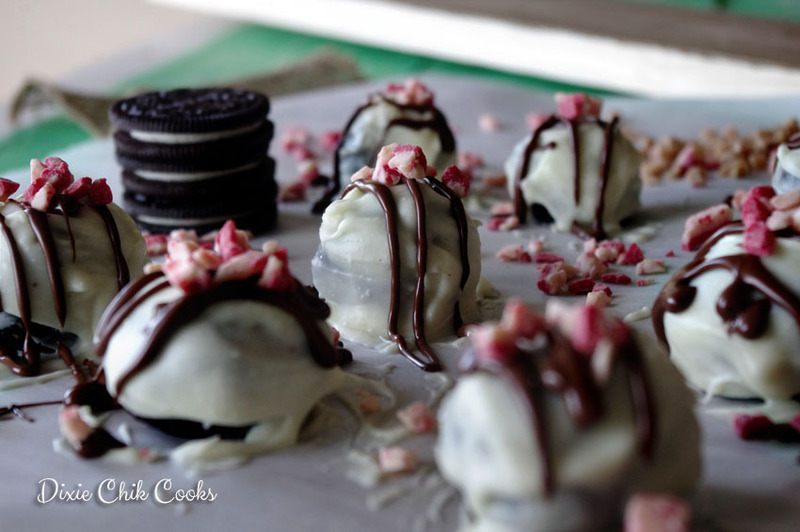 Dip the cookie balls in the white chocolate, drizzle with milk chocolate and sprinkle with peppermint chips. Freeze for about 15 minutes. Store in an airtight container. This post is sponsored by Yummly, and although I was compensated for this post, my opinions are all my own. 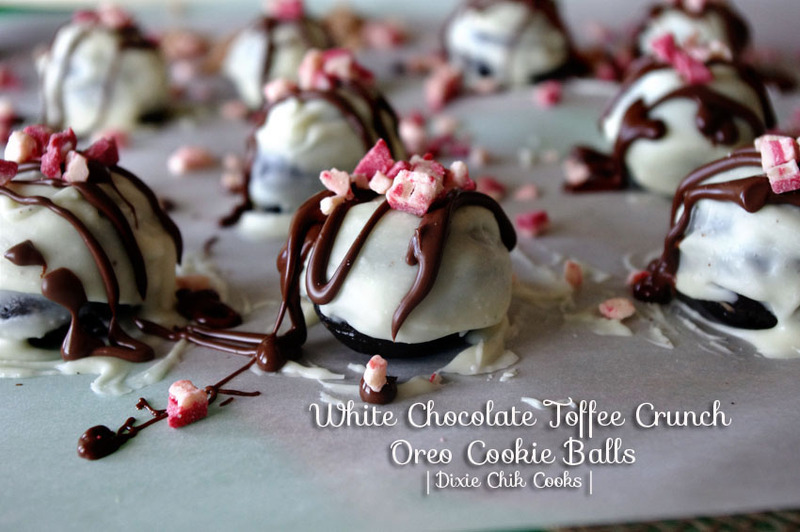 chocolate, cookies, holiday recipes, oreo, oreo recipes, oreocookieballs, peppermint, toffee, white chocolate. Bookmark. I’m pretty sure Yummly should hire you, these look fantastic! Thanks for sharing on the weekend re-Treat link party! What festive Cookie Balls, they look delicious. Thanks so much for sharing your great recipe with Full Plate Thursday and enjoy your Thanksgiving week! OM gosh; with the way I’m foaming at the mouth over here, you’d think I never ate food before :o) These look and sound fabulous! I just pinned to my food board and tweeted about this recipe! Thanks so much for sharing at The PINcentive Blog Hop. Hope you’re having a great week and happy Friday! These look absolutely delicious! Peppermint – check. Chocolate – check. Oreos – check. Simply mouthwatering! 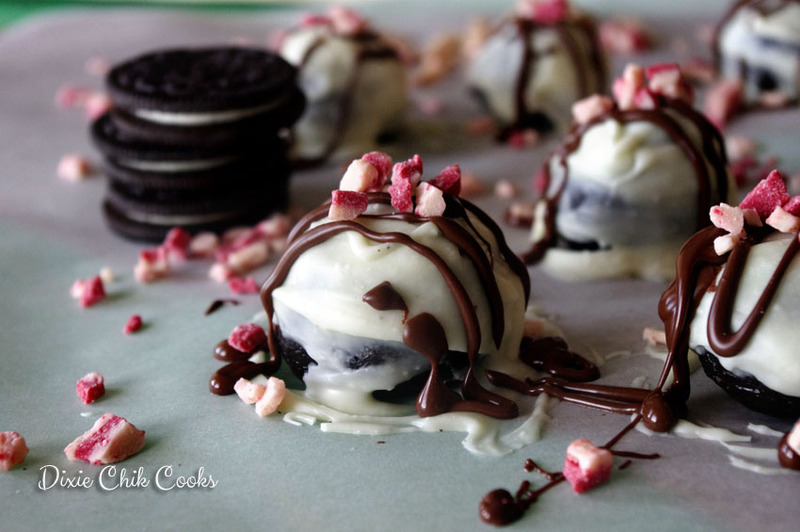 I love Oreo Cookies and this just makes me drool. These would be great for a party…..
Ummmm, do you deliver?! These look amazing. Hello. Stopping by from the blog hop. This looks amazing. It’s a pity I don’t have a food processor, but I can probably find another way to smash them into crumbs.